Many people don’t realize that when they buy TransMagic PRO or EXPERT, they automatically gain access to the PowerPack for SOLIDWORKS. 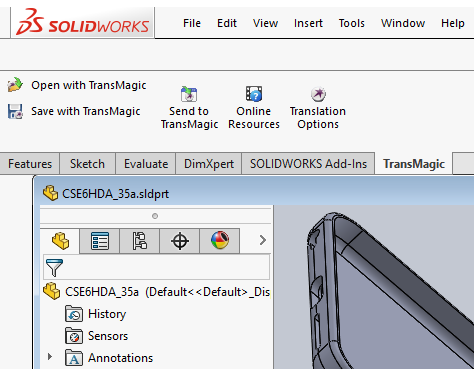 TransMagic’s PowerPack for SOLIDWORKS provides thirteen more formats for SOLIDWORKS users, including CAD and polygonal formats, the latest versions of those formats, and built-in repair tools, all from inside the SOLIDWORKS interface! With additional formats and versions, you have the ability to serve a wider range of customers and you have more options in those instances where there is a problem reading or writing a particular format. Not only that, but you have access to different versions of the same translator; for example, SOLIDWORKS has CATIA V5 Read capability, but if you have problems with the traditional CATIA V5 Read, it could be highly advantageous to have access to a different CATIA V5 translator. Because all want to avoid working with bad geometry and missing data, having another quality translator to throw at a problem can sometimes be a lifesaver. From inside of SOLIDWORKS, Read formats such as JT and SMS, as well as different versions of CATIA V4 (.model), CATIA V5 (.CATPart), STEP and IGES. You also get support for the latest versions of each format, expanding the percentage of customer files you can open. Broaden your capabilities to Save As to include CATIA V4 (.Model), CATIA V5 (.CATPart & CATProduct), JT, STEP 242 (.stp), HOOPS (.hmf), NGRAIN (.3ko), SMS, WebGL (.html), OBJ (.obj) and POD (.pod). Again, all of these formats in the latest available versions of each; for example, the latest version of JT at the time of this writing is 10.2. With Powerpack for SOLIDWORKS, you have access to all of TransMagic’s settings from inside of SOLIDWORKS, giving you the ability to control the visibility of elements such as edges, points and hidden geometry, as well as the version of each format you will save to. JT Write, for example, gives you checkboxes for Transfer Attributes, Write Out Point Bodies, Write B-Rep Data, Write Mass Props, Write PMI, JT Version Number, Assembly Output file Type, Use JT Config File, and Polygon Output Options. 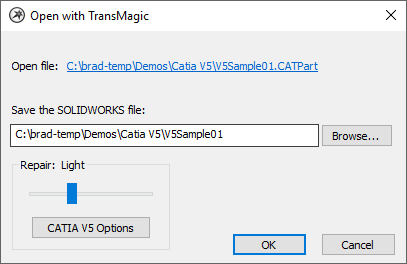 This button allows you to open the current file in TransMagic standalone, for advanced repair procedures (if you have the MagicHeal add-on), or any other TransMagic-specific work such as Polygon Reduction, Poly to CAD, Markup, Dynamic Dimensioning or Assembly Flattening. You can read more about TransMagic’s advanced repair tools here. The ‘Open with TransMagic’ dialog allows you to set the degree of repair to none, Light, Full and Both. From the Open with TransMagic dialog, you can access TransMagic’s automatic repair tools. Everyone who uses PowerPack for SOLIDWORKS has access to Light Repair, which removes zero length edges, zero area faces, negative area faces, duplicate vertices, duplicate edges, and where possible converts spline surfaces to analytic surfaces and finally stitches all surfaces together as long as they are within a specified gap tolerance, and does all of this while the file is being opened. If you have the MagicHeal add on, you also have access to Full Repair, which makes more advanced repairs on geometry as it is being opened, such as extending and reintersecting surface edges to create a cohesive watertight solid, and analyzing and snapping surfaces to fix surface tangencies. You also have access to Both, a slider selection that runs both Light and Full Repair. From the Open in TransMagic dialog, simply select the level of repair you want to invoke, and click the OK button. Read more about PowerPack for SOLIDWORKS here, and check out the 2-minute PowerPack for SOLIDWORKS video below.